Flint Laub and his wives, Michelle Laub, left, and Ruth Anne Laub, are surrounded by some of their children in their kitchen at lunchtime on Nov. 18, 2018 on The Ranch near Humansville, Missouri. 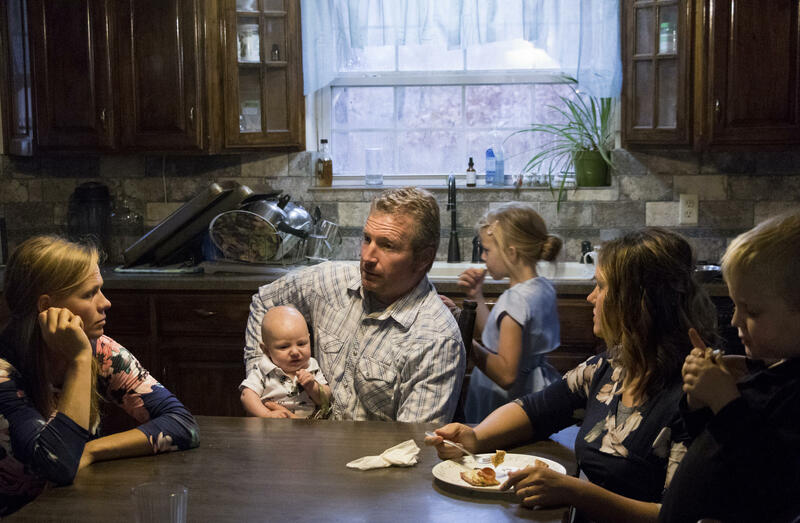 In a story for The Salt Lake Tribune and The Guardian, reporter Nate Carlisle takes a deep dive into a polygamist community of about 400 people in Missouri. He traveled to what locals refer to as “the compound” — polygamist members call it “the ranch” — near Humansville, Missouri in November. KUER reporter Daysha Eaton talked with Carlisle about his reporting and what he learned about this little-known sect of Mormonism. Daysha Eaton: So, you have this article and you've been working on it for some time. Can you tell me a little bit about how you got onto this? Nate Carlisle: About this time a year ago, I was speaking with a polygamist and he told me that a lot of his friends were moving to Missouri and I thought that was peculiar. I hadn't heard much about polygamy in Missouri, and that people would actually be moving there surprised me. So I tracked down some of the people that recently moved there as well as some others that had family there and knew about the area. And I just started trying to figure out what I could learn about the community, which was difficult because there's not much written about this community. Eventually, I made contact with one of the elders and asked if I could travel there and go to church with them one Sunday, and he agreed. My mother's side of the family is all from Sedalia, Missouri which is kind of west-central Missouri. This polygamist community I traveled to would be about an hour and a half south of there. And then I went to the University of Missouri, so I'm very familiar with the state of Missouri — I still have family there. But, I was not particularly familiar with Southwest Missouri where this community is located. I really knew nothing about this group of polygamists — or fundamentalist Mormons if you prefer — until I traveled there. This has been kind of a not quite a secret, but not a well-promoted community. That was one reason it was intriguing to me. Community members of The Ranch gather for a Sunday morning church service in the gymnasium of the Kingdom School building on Nov. 18, 2018 near Humansville, Missouri. After church, the community members spend time cleaning up chairs and mingling with each other before heading off to lunches with their families. The gymnasium is part of a cluster of buildings dedicated to a homeschooling co-op that residents of The Ranch run. DE: Why do you think that this group chose Missouri specifically? NC: Well, there is a little bit of history on this. I came to find out that the elders who are founders of this community were living in southwest Utah. One man thought he heard the voice of God one day and climbed a mountain and God told this man to buy a farm in Missouri. So, he went back and grabbed some of his brothers and friends and other family and they started driving east. They stopped at a realtor in Fort Scott, Kansas, just across the state line from Missouri. There was a brochure there for 600 undeveloped acres in southwest Missouri between the towns of Humansville and Stockton. They came up with the money, and that was it. They were living in tents for the first summer or so until they could get houses built. This is 1983, by the way. DE: As a reporter, do you see any incentives or reasons or logic behind this move aside from a voice from the heavens? NC: The only other practical reason for this community, if you're thinking about pragmatism, is that it is in proximity to Independence, Missouri. There is a prophecy that Joseph Smith — the founder of the Church of Jesus Christ of Latter-day Saints — gave that when Christ returns, he will return to Independence, Missouri. Joseph Smith thought it was Zion. So, they are quite a bit closer in proximity to Independence. There's still about a two-hour drive away, but certainly closer than they would be if they were still in Utah. DE: Tell me a little bit just about what you learned you spent a lot of time with these families. What were some of the things that really struck you? NC: Well, first, they were pretty well integrated into southwest Missouri. A lot of people own construction businesses of some kind that get some work all over the area. There's a steel fabrication shop that employs a lot of the folks in the community and they have to do business with people all over the country for their fabrication business. Despite that, not a lot is known, even amongst the locals there, about that community. I came to find out that a lot of the other people around southwest Missouri refer to the polygamist community as “the compound,” even though there's no tall walls, no armed guards, nothing like that. Even the local prosecutor refers to it as the compound. I think it just goes to show that not much is known about this place. I mean, I drove right in. Everyone was nice — I didn't see a gun all weekend. It just speaks to how out in the woods doing their own thing they kind of are. DE: This is a society that is run by — it sounds like — mostly white men. How do you feel being a white male reporter influenced your ability to get into this community? NC: Well, I'm sure I have things easier than reporters in other demographics might have it. As for it being run by white men, I think that's correct. I think the women in that community, however, would tell you that they're not prisoners. I mean, I raise those questions with some people about “what is it like to live here for a woman?”. There's a lot of women there chosen to live there. They all tell me that they're perfectly happy and if they weren’t, they would leave. For what it's worth, the community has had turnover over the years. Some families have come and some families have gone. Some families have left polygamy and joined the mainstream Church of Jesus Christ of Latter-day Saints. So, it's clearly not for everyone. But I think it would be a mistake to just assume that you know every woman there is oppressed. DE: How do you think you're being a man affected your interviews with the women specifically? NC: Oh that's a good question. That's tough to say. I had a woman photographer with me — actually a graduate student in photojournalism at the University of Missouri. So, she was right there with me for all the interviews and she asked questions too. So it wasn't a solo male operation. I'd like to think they were as open and honest with me as they would be a woman. I mean, we’re trained in interviewing techniques that are supposed to kind of smooth over some of those gender biases that either the interviewer or interviewee might have. DE: And, you did mention that there was a Hispanic Mexican man who was living in the compound in your story. Were there other ethnicities or was this kind of an anomaly. NC: Well, it's not necessarily an anomaly. I mean there's a pretty fair crop of people from Mexico that are in this community. Now, that gentleman you mentioned, yes he has a Mexican mother. Even though some of the other folks may be Mexican by birth, they don't necessarily have a Latino parent. There's a pretty good crop of Anglos in Mexico practicing one form of Mormonism or another. So, I don't know how many of the people in the community actually have Mexican or Latin ancestry. Be as it may, I think it does speak to how this community is much more of a melting pot than some other polygamist communities you'll find, even here in Utah. The different polygamist groups haven't always gotten along very well — I talk about that in the article. And yet, you've got at least — depending on how you count them — four distinct groups of polygamists in this community and they seemed to get along well. 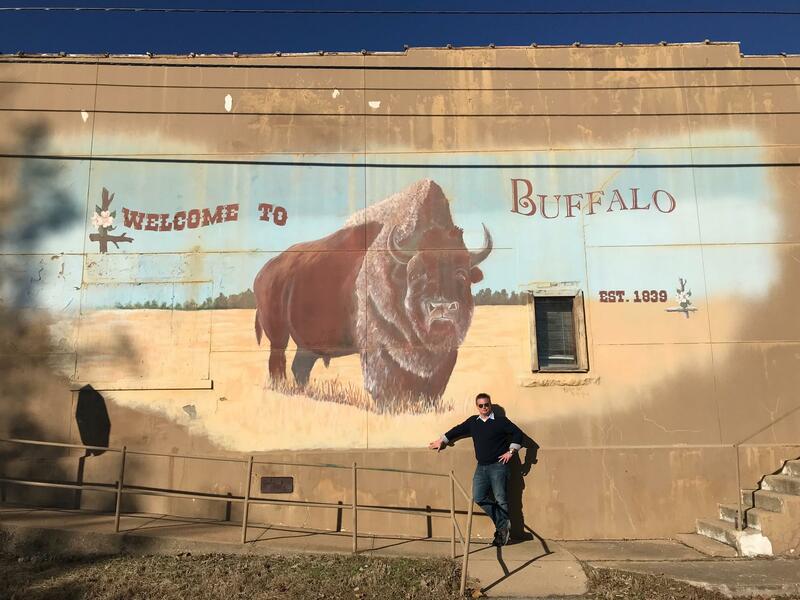 Salt Lake Tribune reporter Nate Carlisle poses in Buffalo, Mo., Nov. 16, 2018. Carlisle traveled to southwest Missouri to interview polygamists there. DE: And, could you explain how this sect is treated by the LDS church and why? NC: It's a little bit unusual. Every time there's a fifth Sunday of a month the polygamists on the ranch as well as the local Church of Jesus Christ of Latter-day Saints ward in Stockton will hold a joint service at the school that the community operates. And of course, they work from a lot of the same texts — the Book of Mormon, Doctrines of Covenants, the Bible. So, there's a lot of synergy in that regard. But again, that's unusual. You don't find that in Utah, for example, with polygamist churches holding joint services with the mainstream Churches of Jesus Christ of Latter-day Saints. DE: So they’re more accepted there, it sounds like. NC: Yes, yes that's true. Outside Water Canyon Elementary School in Hildale, Utah, children are dressed up in costumes and scurrying from car to car in the parking lot asking politely for candy. For most of his life Don Holm was a faithful member of the Fundamentalist Church of Jesus Christ of Latter-Day Saints — a polygamist group often referred to as FLDS. Then, in 2004, Warren Jeffs — the group’s prophet — deemed Holm unworthy of his family and the home that he had built. He kicked Holm out.